Dynamic Defensive Dojo in Glover | Fit Families | Kids VT - small people, big ideas! Japan is on the other side of the world from the Northeast Kingdom of Vermont. But each Friday night, Japanese flags hang from the ceiling of the Glover Town Hall during family karate class, transforming it into the Dynamic Defensive Dojo. At a recent session, four adults and one teenager practice their kata, a series of movements, gliding quickly across the floor in unison. They're preparing for their next belt tests, which allow them to progress to higher levels of karate mastery. They step and spin across the floor, hands moving before their faces in a series of strikes and blocks. Their motions are smooth, controlled and as graceful as they are powerful. "This is a very family-friendly dojo," says Tim Goad, the sensei, or teacher, of the class, which welcomes all ages. "Families can build a bond training together." Goad and his students practice Shotokan karate, a style known for focusing equally on feet and hand movements. Although it can be difficult, this martial art is built upon a simple theory: "The straight line of movement is the most powerful," Goad explains. 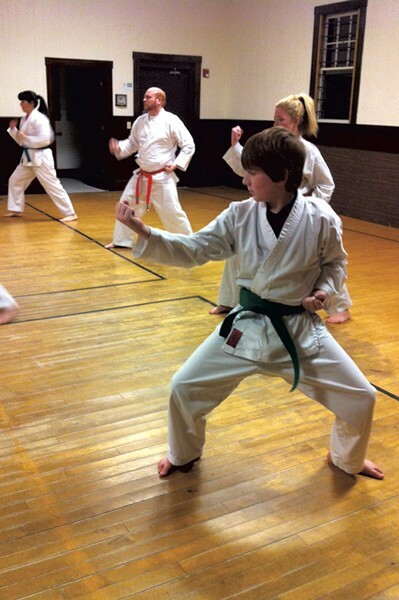 In addition to the kata, which students practice during every class, Goad also integrates speed drills, plyometrics (jump training), foot-hand-eye coordination moves and circuit training to build his students' strength and balance. For younger children, he uses games to encourage these skills. Wearing protective gear, students also practice carefully controlled sparring. Family, Goad says, is the key to helping children stick with the sport. "Kids whose parents are involved, who have positive encouragement, are the most likely to continue with karate," he says. Students don't just learn from their sensei, but from each other. Goad encourages his more advanced pupils to help those in a lower belt level, creating a collaborative environment. "When people teach something," he says, "they become better at doing it." Goad has taught karate for more than 25 years in Vermont; his fourth-degree black belt — of a possible five — puts him at nearly top rank. He makes his students work hard while emphasizing the importance of treating their bodies well. "I love to see the progression," says Goad. "To see a kid with no balance develop amazing balance, to watch the growth as a human being — it's really impressive." Karate's benefits aren't just physical. A code of ethics forms the basis of this martial art. Students are taught to seek perfection of character, honor the path of truth, display courtesy, endeavor to excel and refrain from violent behavior. "What gives karate a bad name is the media," says Goad. "It's actually the opposite of violent." Ready to Go to the Dojo? Karate family class meets from 6:30-8 p.m. on Mondays and Fridays at the Glover Town Hall. 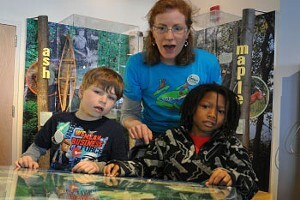 Or catch the children's class for ages 3-12 on Fridays from 5:30-6:30 p.m. Monthly rates are $30 for one person; $50 for 2 people; $75 for a family of three or more. An additional $10 registration fee is charged each year. For more information, find the Dynamic Defensive Dojo on Facebook, or contact Sensei Tim Goad at 323-9851.